I put out a call on Twitter the other day seeing if anyone would be interested in writing for BCLionsDen.ca this season. Little did I know the riches that would fall into my lap this morning. I am absolutely thrilled to announce that we have added Jann Shreve and Jack Bedell to our writing team here in the den. 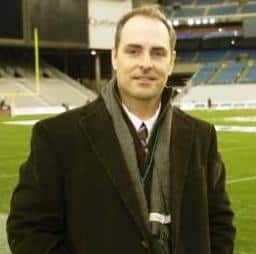 Both Jann and Jack wrote for the Score.ca last year and are not only talented writers, they possess a real passion for the CFL. Their roles will be to contribute thoughts on any aspect of the league and provide an eastern persepctive of the CFL. Their experience and contacts will provide us with a new dimension to the site, and I am very excited about adding them to our team. Here is a little background about our newest writers! Jack Bedell has done a lot of work in CFL circles over the years. He’s based in the U.S. but has a tremendous passion and understanding of football and of the Canadian game. A fan of the Montreal Alouettes, Jack directs the creative writing program at SLU (South Eastern Louisiana University) and writes for the MontrealAlouettes.com. He also appears on a radio show to discuss the Alouettes and other football matters on the TEAM 990 in Montreal. “I’m very honored to be part of one of the most vibrant fan sites in the CFL. I hope Den readers won’t hold my Als fanhood against me!”, Bedell said. You can follow Jack’s wisdom of all things football on Twitter by following @JackBedell. A native of LaSalle, ON, Jann has been a sports fan her whole life. She has participated in athletics since elementary school and has competed in track and field for the University of Windsor. She currently plays in a touch football league in Toronto, ON. Jann has loved football her whole life, and became an avid follower of the CFL when her brother was drafted and her mother needed the rules explained. She has a passion for writing, reading, music and playing video games. “I’m just happy to be here, y’know, gonna go out there and do my thing, help my team by making plays and get to Edmonton in November!” joked Shreve about joining the BCLionsDen.ca team. Jann can be followed on Twitter as @LittleMissCFL. There is no doubt in my mind that these additions are going to take the den to another level as far as being a regular stop for Lions and CFL fans online.